Design your own profitable trading system. There are hundreds of “trading gurus” who want to sell you get-rich-quick products for big bucks. Maybe you’ve bought a few already. Some of them work – some of these programs are even great. But where almost all of them fail is in painting a picture of how trading works. But today, almost every trading system I trade is profitable. Why? Because my trial and error is behind me now. I know what works and what does not. I simply do not mess with the hype that does not work; I stick with trading plans that do work. Like me, you may have been guilty of this in the past. Maybe you are doing it right now. If you are, then stick with me. I am going to share with you far better and more effective ways to design profitable trading systems. Let me share with you my step-by-step, blueprint anyone can follow to design profitable, part time trading systems – tailored to your unique situation. 7+ years in development and tested with hundreds of my coaching clients, this blueprint has now been proven to work with forex, stocks, options, futures, cfds, and all other markets. Perfectly suited to the beginner/intermediate looking to trade intraday or longer time frames – this is the complete guide to profitable trading. But why am I sharing this information? Please understand, becoming a successful trader takes work! If you believe you can purchase a robot that can automatically trade for you, depositing large sums of money into your bank account like clockwork, with little or no work… this website isn’t for you. Trading isn’t a get rich quick philosophy – to succeed you will need passion, commitment, and a desire to win! – if you bring those attributes, I can take you the rest of the way. David presenting live @ his workshop. Wish I had a site like this one, I will link back I think my readers would enjoy your site. I was skeptical when I looked at the title but then I started reading the book and was SPEECHLESS! This thing is FANTASTIC! Despite the fact that I have YEARS of experience trading, I’m now using the Ultimate Trading Systems to design every new trading system! The information, links, tips, and inside tricks are worth GOLD! Much better than lots of “must-reads”. After reading some trading books I think yours is the best that I read so far as it covers lots of areas with clear facts. Why reading ten other books if yours is covering all? Of course as you put such a lot of information in your book it requires full attention when reading. My name is Murray Marshall and I’m reading your new version of trading systems 2.0. The course has so much common sense and it’s such an easy read because you have distilled what would be hundreds of pages into a simple but effective trading guidebook. I have reviewed this Trading Manual by David Jenyns, and I’d like to say, what a great introduction to the world of trading. David lays down the foundation for success. If you follow what he says here in this little gem, you will ultimately become a winner. It will give you an understanding of ‘risk’ and the ever so important ‘money management’, which David, in all of his material, excels in. 2. Learn about pulling the trigger. 3. Learn about managing a Trade as it progresses through to being closed out. 4. And to learn about what’s required of ‘you’ to be the success that ‘you’ want to be. Absolutely wonderful – NO! I mean… Your manual ROCKS ! You’ve simply put together a jamb-packed, informative, step-by-step approach to trading! :o) You’ve done it so well in fact, that it’s like you made what was once a narrow and crooked path of learning into a “6 – Lane Express Highway” leading to a canyon filled with GOLD!! You’ve simply got the ability to guide your readers through an amazingly clear and uncluttered learning curve of what it takes to grasp the fundamentals of trading successfully! You’ve by-passed all the so-called experts, cut out the misinformation, taken out the clutter and used your own “in the trenches” experience to develop an amazing 11-step plan to become a successful trader. To some people, this may seem so few steps . . . but you’ve presented it in such a way that there is no other alternative to learn unless people want to do it the hard way! Instead – I’m all for your awesome tool to successful trading! Thanks so much David! I hope you continue to use your remarkable ability of training individuals to trade in an entirely successful way! Ultimate Trading Systems kept me glued from beginning to end. Taking a systematic step-by-step approach, this “blueprint” discusses all the aspects of designing and implementing a trading system, and explains clearly the reasons for each decision. I found it a detailed route map to planning to trade profitably. An easy read but packed with content, this blueprint is one I will refer to again and again. It gives clear direction on every aspect to becoming a successful trader. 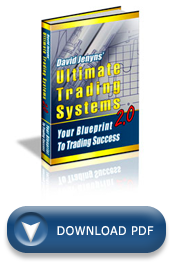 The Ultimate Trading System by David is truly the most comprehensive and practical course available in the market, covering all the key winning aspects to the development of a sound and robust trading system. The entire package is simply awesome! How I wish I had this course when I first started in the world of trading. Thanks for sharing so much vital information in your indispensable and highly recommended course. Thanks again, David! I think it was a great read. It summarizes a lot of things about trading with just 56 pages; other books would have been around 200 pages or more. Because every chapter/section is precise and to the point, I was able to retain most of the vital information. I would definitely recommend this book. I like what David has to say, it makes great scent to me. Excellent! All successful traders say you need to develop your own trading system based on your own personality … but there are very few books on the market that show you how to actually do this. Finally here is an easy to follow, step-by-step process that will allow anyone to develop their own successful system. This is the strategy I was waiting for. I have already started to implement your suggestions and I can see it working. Thank you very much again. True enough, it can indeed be called the Holy Grail of trading. Wish I have it years back! Keep up the good work! Wow! I have read countless trading books and honestly this is the first ever book that really takes me to a level of a professional trader. The step by step instructions are fantastic and I’m absolutely sure that anybody, whether they have been long in this business or newcomers, will raise themselves to a professional level should they follow your clear and concise instructions. I’m myself is a living proof. I just couldn’t believe myself that I’m really trading like a pro after following your specific instructions on how to become a successful traders. My trading satisfaction, not to mention my profitability, improves significantly. I wouldn’t trade this book with any other books in this world. A real classic. I wish i had this document when i started trading. Well, i most probably would have gone through the whole proses that i did to become what i did in any case, i would not have believed your document in any case. Today after 8 years i do believe your document because i know what i know. This totally blows your previous manual out of the water. I especially liked the ‘ M & M ‘s : Mind set & Money management, it’s clear, concise & informative, if people treated trading as their business there would be more profitable traders. This manual clearly addresses this problem & I would recommend UTS 2.0 to everyone. Good article, in fact one the few I’ve seen recently that makes any sense. If you’re not already a good trader, start here, looks like our mate David has it right on. Hi ‘Test’ … yes the comments are real. I’m based in London, does your system works in UK too, if so how is the payment process? #1. My method works for all markets and in all countries. Thanks for your information and free training on trading, you’re training is Good. I’ve one more doubt, i.e. some sites and some people are recommending to use Auto trade tools, like forexautopilot, forex-megadroid, Fabturbo, etc. Kindly let me know which one would be better to use as autopilot and auto profit. I’m not too sure you’re going to like this but…. If you believe you can purchase a robot that can automatically trade for you, depositing large sums of money into your bank account like clockwork, with little or no work… you’re dreaming. Successful, consistent, highly profitable trading takes work. Deep down, whether you admit it consciously or unconsciously, you know this to be true. Sorry to burst the bubble. Stick with it though, the rewards are worth it. Dear sir, I don’t know anything on forex.Will your coaching be enough to trade successfully? This website is designed to give you the foundations for successful trading. If you ensure you have each component of the trading plan, as I outline it, covered, this is more than enough to trade successfully. That said, please understand, this is not a get rich quick scheme and the methodology requires work. Wishing your all the best for the journey ahead. or read it online for free on this website. It’s great that you’re teaching people how it’s smart to have an actual trading system. So many people I hear about have no system at all and they just buy whatever stocks that they can find. Actually, I used to have the same problem. It wasn’t until I focused on money management, and building a trading system until I started experience success trading. I’m looking forward to viewing the rest of your free course. thank you for your accurate and honest advice regarding attempting to be a successful trader…….I hope your generosity will come back to you a hundredfold. Im really excited to try your system and this may sound a little silly, but my hesitancy is your comments page. Can you please explain why most of your comments took place on July 8th within a 1 hour time span? No offense , but that seems a little strange. Thanks for asking… The initial comments were copied over from the old website template. We had to manually copy those over ourselves. I should dig up the old dates and update them accordingly. Thanks for your comments and welcome aboard. Contact http://www.davidjenyns.com/support and they can give you our paypal details. Stick with it, the rewards are worth it. Thanks, this blog aided me in solving some issues with the latest release, Why do they always leave out vital documentation when they release a new version? It may be trivial to them but not to me. I’m sure we’re not alone either. I am in the forex trading word for a long time. I know the basics of technical analysis and psychological controls a trader must have. I just want to ask is your book for complete newbies to teach the basics or it contains any robust profitable strategy? Are you confident that if someone can control the psychological factors and STICK TO YOUR TRADING RULES, will he come out as a winner in the long run. looks interesting, question; would you say using a discretionary trading system is better than an automated trading software? Hooman: Head over to http://www.meta-formula.com and subscribe to my newsletter there! Arup: My book is available for free on this website. You can check out my methods in full without spending a cent. In answer to your question I do believe if someone can control the psychological factors and stick to the rules, they can become a profitable trader. Jared: I personally like to automate trading systems as much as possible. That said, I think you always need to have some discretionary measures should your system not trade as your back testing results indicate it should. Informative and easy to watch, and understand. My visitors would like this, so I’m linking to it. Nope it’s not fake ðŸ™‚ That said, I usually don’t approve these sorts of posts since they’re not really add any value for anyone else. Hoping to see some more substantial posts from you soon. Hi i recently started reading about trading and am looking and possibility of becoming a trader. before I finish my last basic trading book, I?ve reading the old books for about four years, taking notes before any real trading, and 2011 year is my only trading paper year, so, I will begin to read your system to know what do you have to add to my little trading understanding. i cant find where on this website you are selling your book for $97. I read about it in one of the discussions but can’t find it. You might be thinking of http://www.trading-secrets-revealed.com ? Let me know if that’s what you’re thinking. Nice read. I found your site on yahoo and i have your page saved on my favorite read list!